The Passbook feature that arrived on the iPhone 5 with iOS 6 is an attempt to turn your modern smartphone into a version of a digital wallet. Some people already use the iPhone to scan boarding passes at the airport or to pay for coffee in a Starbucks through a third-party app. 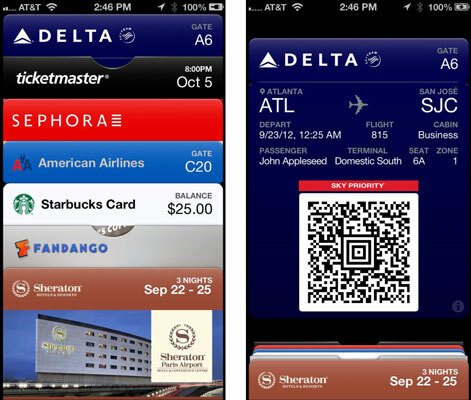 Passbook provides a single repository for all these items, along with movie tickets, coupons, and gift cards. No more fumbling through printouts, apps, or e-mails to find the right ticket, coupon, or pass. Moreover, Apple has made it so that Passbook is time and location based. In other words, the boarding pass appears when you get to the airport, even on the iPhone Lock screen, and you’re notified of any gate changes. Or walk into the coffee shop and the appropriate gift card pops up. Apple says you can find Passbook-capable apps in the App Store. You may also see an Add to Passbook link on a merchant’s website — just make sure you’re signed into your iCloud account to add passes to the Passbook app. To use a given pass, tap it in the Passbook app, and then point it at the barcode reader or scanner at the terminal, neighborhood multiplex, hotel, department store, or whatever other place you frequent. 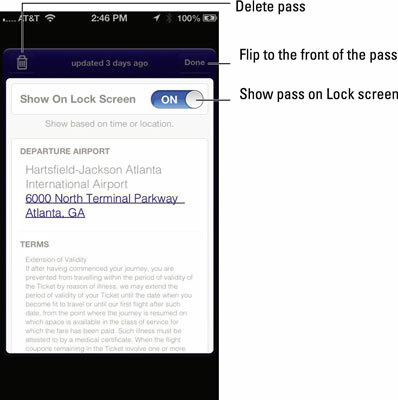 To show a pass on the Lock screen, tap the information button (a circled i) on the bottom-right front of the pass and make sure that the Show on Lock Screen switch is in the On position.